People had been telling me about Nargis long before I gave it a try. I am not a fan of spicy food so I kept putting it off, until one day, when a friend and I felt like eating in a new place for a change. That was it, I loved it. Nargis impresses everyone from the moment they enter. So colourful and abundantly decorated, it has the look and feel of a true restaurant in Bombay. With saris draped over the windows, vitro-mosaic lamps emitting glimmering light, a buddha statue saying a lot with no words, every nook and corner urges mysticism. Photos of Nargis– a Bollywood actress of the 1940s-1960s- couldn’t be missing from the walls. There are tables indoors, though for the summer meals the best seating is on the scenic terrace in front of the entrance. Nargis appeals to a wide clientele that includes low-budget students to wealthy professionals. The menu features authentic plates. For starters, order the red lentils with vegetables, and the famous tandoori chicken as a main course. The naan (a pita-like bread with butter and garlic) and the spicy rice with cinnamon are two tried-and-true sides. If you are an amateur in spicy flavors, you will appreciate the yogurt dip which is always served to put out the fire in your mouth. 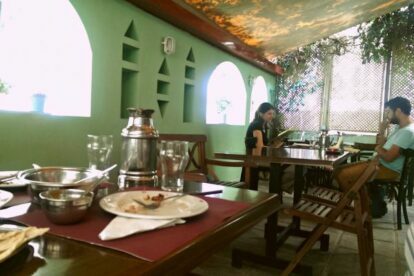 If you wish for a wake-up meal and a mental getaway to the Far East, cross Nargis’s threshold and you’ll have it.